A few weeks ago, my eldest grandson, 14, came to Maine to spend some time with us. One day he accompanied me to the transfer station (a nice word for “The Dump”). There is no garbage pickup in rural Maine; our local transfer station, about 8 miles away, is open several times a week during set hours and that’s where town residents haul their recyclable and regular trash. 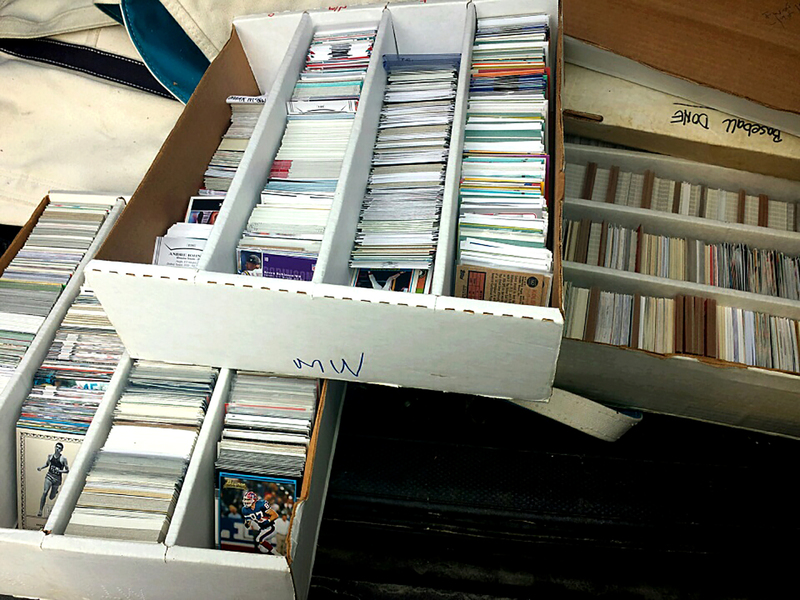 When we went over to the dumpster that holds recyclable trash, my grandson noticed a few new-looking baseball cards sitting on a bunch of discarded corrugated cardboard. He asked me if I would allow him to climb in the (clean) dumpster and take the cards. “I think we’d better ask the guys who run the dump,” I answered. Mostly I was concerned for my grandson’s safety – – I didn’t want them to not know my grandson was rummaging around in the dumpster, only to turn on the compactor and cause a horrific accident. “You want the cards? Sure! Go ahead in and get ’em,” the transfer station employee said. “And if you’d like me to start saving cards for you, just let me know,” he added. The worker told us that one of the local residents makes “a little money on the side” by trading baseball cards. He travels around New England, going to yard sales, auctions, and searching through Craigslist ads looking for baseball cards, which he buys in bulk. He then goes through the stacks and stacks of cards, quickly filtering out 3 to 10 cards out of hundreds that have collectible value in today’s market. The rest, he brings to the dump. “I’ll save the cards for you if you want ’em,” the worker told us. “Just say the word.” Sure, I answered, we’d take whatever cards he’d scrounge up. I didn’t think anything more about it. A couple of weeks went by and my grandson returned home. When I next ventured to the dump, the worker scurried towards me, carrying three cardboard boxes. “I’ve been saving cards for you,” he said. “And I’ll keep saving them until you tell me to stop,” he added. I had forgotten about our conversation, but the transfer station worker had not. I opened one of the boxes. I couldn’t believe my eyes! Each box contained at least 1,000 mint-condition baseball and football cards: 3,000 cards! The initial three boxes of cards saved for me by the worker at the dump. All were in clean, mint condition. I was so excited! Thanking the worker multiple times (and yes, I always bake him goodies every year during Christmas season, and make sure to ask him how his fishing and hunting are coming along in the Summer and Fall), I placed the boxes in the back of my car, imagining my grandsons’ faces when I presented them with the cards upon my return to my hometown. This was definitely a case of one person’s trash being someone else’s treasure. I emailed my kids, alerting them to my plans. “Spoken like a true parent,” I replied. “When did you guys get so old and tired? You don’t sound like my kids; you sound like I used to sound when you were little! Just remember how much you used to love collecting these cards when you were kids,” I added with a dose of Jewish Mother guilt-tripping. So with Chanuka coming, my husband and I drove down to our home town, and presented the cards to two sets of grandsons, boys ages 6 thru 14. “I CAN’T BELIEVE IT!” “THANK YOU SO MUCH!” “WOW!” “Savta, YOU ROCK!” “AWESOME!” “BEST! PRESENT! EVER!” were some of the reactions. For the next six hours the boys got busy sorting the 3,000 cards. 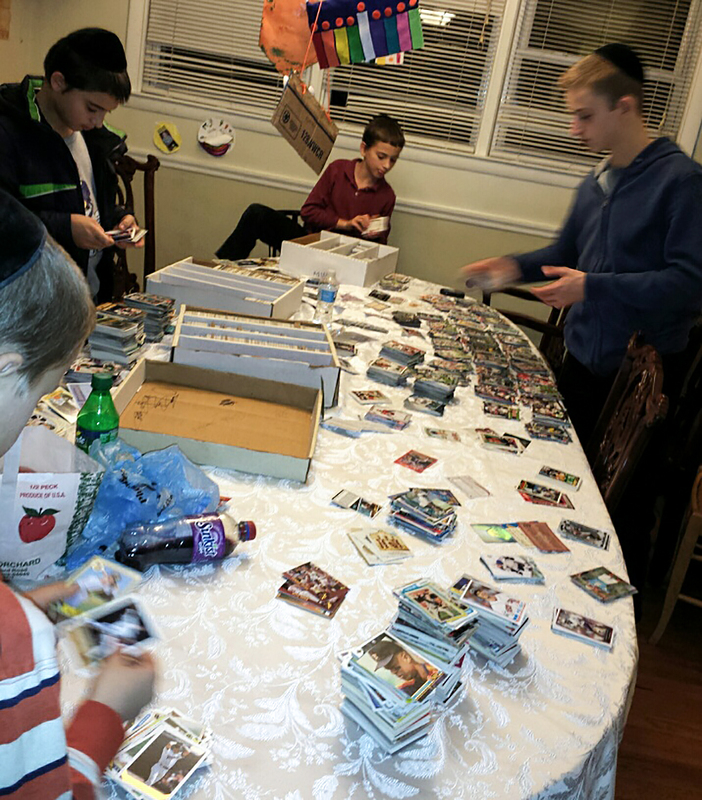 Some of the grandsons sorting 3,000 baseball and football cards. Their mother was convinced she’d never get her table back. I have no idea if they found any treasures; for all I know these cards are totally worthless. But for six hours (and four hours the following day), there was only joy: no fighting, no sibling rivalry; the boy cousins had yet another bonding experience; and, completely free of charge and thanks to the simple kindness of my local dump worker in Maine . . . I was the best Savta in the whole world.